Display light weight signs, etc. Clip Strip Corp.has a wide range of ceiling sign holder options, but if you have a metal grid and a lightweight store sign, these magnetic ceiling hooks would be a very good fit. Retail stores worldwide trust our ceiling hanging accessories to assist them to hang signage and communicate strongly at the point of purchase with quality store equipment such as this line of magnetic ceiling hook sign holders accessories. Not sure if its the right ceiling hanging product? Try out a free sample to see if it fits! 1" Diameter, 9 Pounds of Vertical Pull Force, for lightweight signage on ceiling grids. Test for intended use. 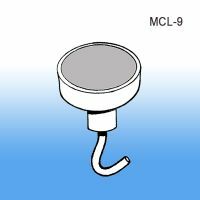 Minimum quantity for "Magnetic Ceiling Hook Sign Holder, 1" Diameter, MCL-9" is 10. 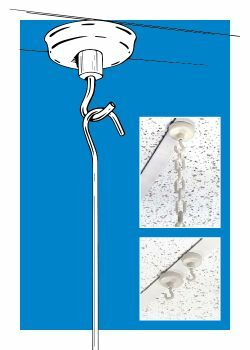 18 Pounds of Vertical Pull Force, 1-1/4" Diameter, for lightweight signage on ceiling grids. Test for intended use.